Caresse Boyers performs at last year’s Swanton Juried Fine Art Exhibit and Sale. She will again be at the opening reception on Friday. This weekend’s Swanton Juried Fine Art Exhibit and Sale will again feature works by artists from the Swanton area and beyond. The Swanton Area Chamber of Commerce will host the exhibit and sale Saturday and Sunday in the Valleywood Golf Club banquet room. The Swanton Juried Fine Art Exhibit and Sale is free to the public on Saturday and Sunday, and the art is all family friendly, Toeppe added. 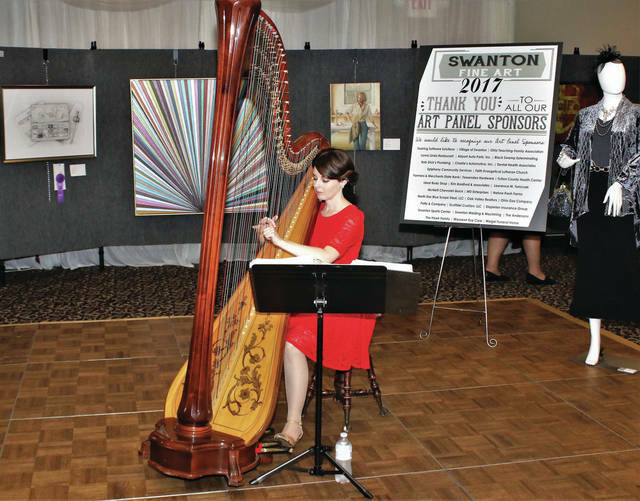 “This exhibit brings in artists and visitors from over 25 cities in northwest Ohio and southeast Michigan, and presents Swanton in a very favorable light as a community that appreciates and supports the arts,” he said. Artists will compete in eight adult categories and three student categories for approximately $5,000 in prizes and scholarships. Those attending will be encouraged to vote for The People’s Choice award. The art will be judged by three highly qualified art jurists headed by Lisa Exner, past president of the Anthony Wayne Arts Commission. Among the communities with artists represented will be Archbold, Delta, Genoa, Holland, Lambertville, Maumee, Napoleon, Paulding, Perrysburg, Sylvania, Toledo, Waterville, Whitehouse, and Wauseon. Toeppe added that he was contacted by an artist from Rudolph, Ohio, wondering if the exhibit was open to artists from outside Swanton. The exhibit will be open to the public Saturday, from 10 a.m. to 5 p.m., and Sunday, from noon to 5 p.m.
An artists reception will be held Friday, and all winners and other places will be selected. Tickets to the reception may be purchased for $15 from Toeppe by calling 419-826-1941.